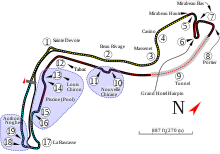 The 2014 Monaco Grand Prix (formally the Formula 1 Grand Prix de Monaco 2014) was a Formula One motor race held on 25 May at the Circuit de Monaco in Monte Carlo. It was the sixth race of the 2014 Formula One season and the 61st running of the event as part of the Formula One World Championship. The 78-lap race was won by Mercedes driver Nico Rosberg after starting from pole position. His teammate Lewis Hamilton finished second and Red Bull Racing driver Daniel Ricciardo came in third. It was Rosberg's second victory of the season, his second consecutive win at Monaco, and the fifth of his career. Overcast, Air: 20 to 21 °C (68 to 70 °F), Track: 28 to 30 °C (82 to 86 °F). Rosberg won the pole position by posting the fastest lap in qualifying under controversial circumstances and maintained his advantage going into the first corner. The race was neutralised on the first lap with the deployment of the safety car following an accident between Sergio Pérez and Jenson Button, and when the race restarted Rosberg remained the leader. Adrian Sutil further caused disruption when he crashed his Sauber on lap 24 and Rosberg kept the lead after the field made pit stops. He maintained an varying advantage over Hamilton as the two drivers pulled away from the rest of the field. Rosberg was instructed to conserve fuel while Hamilton was told he was not required to do so. Hamilton later got dirt in his eye in the race's closing stages, allowing Rosberg to pull away. Rosberg held the lead for the remainder of the race to secure the victory. The result meant Rosberg regained the lead of the Drivers' Championship with a four-point advantage over Hamilton. Fernando Alonso remained in third while Ricciardo's third-place finish enabled him to move ahead of teammate Sebastian Vettel. Mercedes further increased their advantage in the Constructors' Championship to be 141 points ahead of Red Bull while Ferrari maintained third position. Force India kept fourth and McLaren overtook Williams for fifth with thirteen races left in the season. The 2014 Monaco Grand Prix was the sixth of 19 scheduled rounds of the 2014 Formula One season, and the 61st running of the race as part of the Formula One World Championship. It was held on 25 May 2014 at the 3.340-kilometre (2.075 mi) nineteen-turn Circuit de Monaco in Monte Carlo. It was officially called the Formula 1 Grand Prix de Monaco 2014. Tyre supplier Pirelli brought two types of tyre to the race: two dry compounds (supersoft "options" and soft "primes"). The supersoft tyres were identified by a red stripe on their side-walls, and the soft tyres were similarly identified in yellow. The drag reduction system (DRS) had one activation zone for the race which was on the straight linking the final and first turns. Before the race Mercedes driver Lewis Hamilton led the Drivers' Championship with 100 points, ahead of teammate Nico Rosberg in second and Fernando Alonso in third place. Sebastian Vettel was fourth on 45 points, seven ahead of teammate Daniel Ricciardo in fifth. Mercedes were leading the Constructors' Championship with 197 points, and Red Bull were second on 84 points. Ferrari (66 points) and Force India (57) contended for third place and Williams rounded out the top five on 46 points. The tension was high between the two Mercedes teammates going into the weekend when Hamilton was found to have altered his car settings during the latter stages of the Spanish Grand Prix, using a higher-powered engine setting than the team had previously allowed in order to stay ahead of teammate Rosberg. Rosberg was then discovered to have done the same while chasing down Hamilton at the end of the Bahrain Grand Prix, though he failed to get past. Despite losing the Drivers' Championship lead to teammate Hamilton in Spain, Rosberg stated he would not be changing his approach and was not heavily focused on the championship but expected the battle to remain tight. Hamilton reckoned his increased comfort with the F1 W05 Hybrid would put Rosberg under pressure in Monaco, saying it was a track where he performed well but the 2013 race was where he was unable to extract the most amount of performance from his car although he hoped to get more out of his Mercedes and wanted to have the Ferrari and Red Bull cars battling him for the victory. The circuit underwent changes following the previous year's event. The track underwent a resurfacing from the exit of Casino corner until the start of the tunnel with small areas before the Novelle chicane and Tabac undergoing a similar change. The pit lane barrier and the debris fencing was renewed and the turn 12 TecPro barrier was made more efficiently constrained. Work on the track was carried out during nighttime conditions to minimise roadside traffic disruption. Jenson Button (McLaren) predicted that the changes would create a situation similar to the 2012 United States Grand Prix where grip was low for all cars and felt the soft compound tyres would be difficult to get working properly. Pérez said the experience around Monaco would be "difficult" but that "It will be a new Monaco - very, very interesting". Alonso stated the race weekend would be "a question mark for everybody" and that the series needed to see which team would adapt their car better for the track. Three practice sessions—two on Thursday and a third on Saturday—were held before the Sunday race. The Thursday morning and afternoon sessions lasted ninety minutes each; the third, one-hour session was held on Saturday morning. Hamilton was fastest in the first practice session, which took place in dry weather conditions, with a lap of 1 minute and 18.271 seconds, 0.032 seconds faster than teammate Rosberg in second. The two Red Bull cars were third and fifth (with Ricciardo ahead of Vettel); they were separated by Alonso's Ferrari. Ricciardo was set to improve his time but was delayed by slower traffic. Kimi Räikkönen, Valtteri Bottas, Sergio Pérez, Kevin Magnussen and Nico Hülkenberg rounded out the session's top-ten drivers. Max Chilton stranded his Marussia after spinning at Mirabeau corner early in the session, and his session ended prematurely. Esteban Gutiérrez went straight on at Sainte Dévote corner. Alonso locked his left front tyre at Mirabeau corner but avoided damaging his car. His teammate Räikkönen spun at Sainte Dévote corner but continued. Marcus Ericsson twice went off the track in practice and was penalised for colliding with Felipe Massa in qualifying. Clouds moved into Monaco upon the end of the first practice session and a heavy hailstorm fell on the track but had ended before the start of the second session. The track was saturated with water and teams opted to keep their drivers in their garages for the 90-minute period's first half. The first cars that ventured onto the track had intermediate tyres installed although the surface dried quickly. Drivers used dry slick tyres in the session's final ten minutes which saw Alonso set the fastest time at 1 minute and 18.482 seconds. His time meant Hamilton remained the fastest overall driver on Thursday. Alonso was four-tenths of a second quicker than Hamilton in second and Vettel was third. Jean-Éric Vergne. Bottas, Pérez, Hülkenberg, Button, Ricciardo and Felipe Massa followed in the top ten. Marcus Ericsson crashed into the barriers leaving Portier corner but reversed away from the area and drove his damaged car back to the pit lane. After taking Friday off—a feature of the event timetable unique to Monaco—[n 1] the drivers returned to action on Saturday in bright weather conditions. All of the leading drivers had trouble getting clear air as they fought for clear space around the narrow circuit which had been made worse by them taking longer than usual to get optimum tyre temperature. Despite having difficulties with his car's handling and narrowly avoiding an accident at Tabac corner, Hamilton set the fastest lap of the weekend so far with a late lap of 1 minute and 16.758 seconds, half of a tenth of a second quicker than the second-placed Ricciardo. Rosberg was third-fastest; Vettel in the other Red Bull was fourth, with the two Ferrari drivers in fifth and sixth (with Alonso faster than Räikkönen). Pérez was seventh-fastest, Hülkenberg eighth, Vergne ninth and Daniil Kvyat completed the top ten ahead of qualifying. Vergne ran off the track at Sainte Dévote and Mirabeau corners. Ericsson went into the Dévote run-off area and reversed to rejoin the track. Nico Rosberg had the sixth pole position of his career despite being investigated for potentially impeding teammate Lewis Hamilton's lap. Saturday afternoon's qualifying session was divided into three parts. The first part ran for 18 minutes, eliminating cars that finished the session 17th or below. The 107% rule was in effect, requiring drivers to reach a time within 107% of the quickest lap to qualify. The second part of the qualifying session lasted 15 minutes, eliminating cars that finished 11th to 16th. The final part of the qualifying session determined first to tenth, deciding the pole position. Cars who progressed to the final qualifying session were not allowed to change tyres for the race's start, using the tyres with which they set their quickest lap times. After the final qualifying session's first runs, Rosberg had provisional pole position with a time of 1 minute and 15.989 seconds, 0.039 seconds ahead of Hamilton. During his second and final quick lap, the German locked his tyres, ran deep at Mirabeau corner and had to abort his lap, before then reversing back onto the race track. The yellow flags that were brought out as a result of the incident forced Hamilton to slow, ruining his final qualifying lap (after he had set a personal best first sector), which stopped him from challenging Rosberg's earlier time. After qualifying ended, Rosberg was investigated by the stewards under suspicion of deliberately spoiling Hamilton's lap. The stewards examined video evidence as well as telemetry data from the team. The sport's governing body, the Fédération Internationale de l'Automobile (FIA), eventually concluded that there was no evidence of any wrongdoing by Rosberg. [n 2] It was Rosberg's second pole position of the season, his second at Monaco, and the sixth of his career. Ricciardo qualified in third, and was unable to improve on his fastest time after sliding on his final timed lap. His teammate Vettel could not use his energy recovery system in the first part of qualifying; he ran in a different mode and the yellow flags meant he was restricted to fourth. The two Ferrari cars of Alonso and Räikkönen were fifth and sixth; both had tyre warming problems. Despite his final lap being affected by the yellow flags, Vergne took seventh and his teammate Kvyat secured ninth after struggling with rear-end control and hit the barriers lining the circuit. He drove to the pit lane for a replacement nose cone. They were separated by Magnussen in eighth and Pérez rounded out the top ten after locking his tyres driving into the Novelle chicane. Hülkenberg was the fastest driver not to advance into the final session; his best lap time of one minute and 17.846 second was nearly two seconds slower than Hamilton's pace in the second session. Button was delayed by a Toro Rosso on his final lap at the Swimming Pool complex and was restricted to 12th. Bottas had front tyre heating problems and was only able to qualify 13th. Romain Grosjean and Pastor Maldonado in the two Lotus cars took 14th and 15th with Massa unable to record a lap time. Ericsson locked his rear tyres going into Mirabeau corner and glanced Massa's car heading into the turn, causing both drivers to hit the barriers. The stewards investigated the incident and Ericsson was handed two penalty points on his super licence and was required to start from the pit lane. Gutiérrez failed to advance beyond the first qualifying session, and was followed by Sauber teammate Adrian Sutil. Jules Bianchi lost half a second because of slower traffic and yellow flags and took 19th. He received a five-place grid penalty, because his team changed a problematic gearbox overnight. As a result, his Marussia teammate Chilton inherited 19th. Kamui Kobayashi used super soft compound tyres on his first two timed laps and made a front wing adjustment but was unable to improve and qualified in 20th. ^1 — Jules Bianchi was given a five-place grid penalty, for an unscheduled gearbox change. ^2 — Marcus Ericsson started from the pit lane after causing a collision with Felipe Massa in the first part of qualifying, preventing Massa from participating in the second qualifying session. Weather conditions at the start of the race were dry and overcast with an air temperature between 20 to 21 °C (68 to 70 °F) and a track temperature ranging from 28 to 30 °C (82 to 86 °F). A 20% chance of rain was forecast. Rosberg's hand clutch was replaced when the one he used in qualifying burned out following his error at Mirabeau corner. After the problems with his car in qualifying, Red Bull changed parts of Vettel's energy recovery system. He did not incur a starting position penalty but was forbidden to use the parts again until the Abu Dhabi Grand Prix. Maldonado was unable to take the start because of a fuel pump failure while stationary on the grid. When the race began from its standing start at 14:00 Central European Summer Time (UTC+2), Rosberg maintained his pole position advantage heading into the first corner with teammate Hamilton in second. Vettel remained in third while Räikkönen advanced from sixth to fourth, ahead of Ricciardo and Alonso who had been boxed in by Ricciardo. After hitting Button's McLaren, Pérez spun leaving Mirabeau corner, and the Force India's suspension was damaged, and had further contact with Sutil, ending his race. The incident blocked the track and forced drivers to reduce their speed in order for them to get past Pérez's stranded car. Kevin Magnussen scored one point in tenth place. The safety car was deployed to allow marshals to remove Pérez's car from the track and into the run-off area. Grosjean's tyre was punctured from contact by Sutil and both drivers made pit stops. Swift work from the marshals allowed the safety car to be withdrawn at the end of the third lap and Rosberg led the field back up to speed. Vettel slowed with a mechanical problem which caused his turbocharger to stop working and was overtaken by the rest of the field in quick succession. He made a pit stop and came out among the leaders and complained he was stuck in first gear. Both Mercedes drivers pulled away from the rest of the field, and Hamilton went two-tenths of a second faster than Rosberg, to be six-tenths of a second behind his teammate. Vettel's turbocharger restarted on lap six but was instructed by his team to retire on the following lap. It was announced that the stewards were investigating the first lap incident between Pérez and Button. On lap nine, Sutil went up the inside of Grosjean, mounted his car on the hairpin kerbs, and passed him for 17th. Kvyat's car developed an exhaust issue but he managed to limp his ailing Toro Rosso back to the pit lane to retire on lap 11. Sutil dived past Ericsson at the Loews hairpin to move into 16th on lap 13, as drivers struggled to keep heat in their tyres. The time deficit between Rosberg and Hamilton varied but held a larger advantage over the rest of the field. Sutil continued to move up the field after passing Chilton at the Novelle chicane to take over 15th on the 17th lap. Rosberg locked his tyres heavily driving into Mirabeau corner but the German driver avoided going into the turn's escape road on lap 18. Shortly afterwards, the stewards issued five-second stop-and-go penalties to Chilton, Ericsson and Gutiérrez for being out of position on the starting grid. Hamilton started to lap faster than teammate Rosberg before the latter responded by going two-tenths of a second quicker than Hamilton to extend his lead. Ricciardo closed to within 1.1 seconds of Räikkönen by lap 22 upon going one second faster than Räikkönen. Cresting a rise leaving the tunnel on the 24th lap, Sutil's car became light under braking from 170 miles per hour (270 km/h), speared into the inside barrier, and slid down the escape road at the Novelle chicane. A marshal ducked under the barrier to avoid getting struck by debris. Sutil was unhurt but the safety car was deployed for debris removal. Hamilton asked his team on the radio whether he should make a pit stop to which they responded that he should remain on the track. All drivers (except for Massa) elected to make pit stops for new tyres. Hamilton was annoyed and asked why he was not allowed to make a pit stop on the previous lap and dropped back from Rosberg so that he would not to wait behind his teammate. Vergne was released directly in front of Magnussen, causing him to swerve to prevent contact. This prompted the stewards to investigate Vergne. On lap 28, Räikkönen had to make a second pit stop for a punctured tyre after Chilton's front wing glanced his left-rear wheel at Mirabeau corner. Räikkönen thus fell to the back of the field. Ricciardo and Alonso consequently moved into third and fourth. The safety car drove into the pit lane at the end of lap 30 and racing resumed with Rosberg leading Hamilton. As the race restarted, Magnussen passed Vergne going into Rasacasse corner but returned it because it had occurred before crossing the second safety car line. Hülkenberg took advantage and drove aggressively by going down the inside of Magnussen at Portier corner and passed him before entering the tunnel to claim seventh. Räikkönen passed Kobayashi at the Novelle chicane for 12th place on lap 33 but ran wide and handed the position back to Kobayashi. Vergne was handed a drive-through penalty for his unsafe pit stop release on the following lap and served it four laps later. After Räikkönen got past Kobayashi, Bianchi made contact with the Japanese driver three times en route to overtaking him around the outside at Rasacasse corner for 13th on lap 36. Upfront, Rosberg continued to lead Hamilton and the two drivers pulled away from the rest of the field. Grosjean started to pressure Kobayashi for 14th but had difficulty passing the driver. He was able to get ahead of Kobayashi by braking late for the Novelle chicane on lap 40. Rosberg was instructed by his team over the radio that he should use longer gears at Sainte Dévote and Casino Square corners to save fuel. This meant Rosberg defended from Hamilton over the next few laps because of him having to lift and coast. Hamilton closed up to Rosberg but was unable to affect an overtaking manoeuvre on his teammate who had faster acceleration entering the tunnel. Massa made his only pit stop of the race on lap 45 and emerged in 11th place behind Räikkönen but ahead of Bianchi. Daniel Ricciardo finished in third position. While Rosberg was instructed to continue conserving fuel, Hamilton was told on his radio that he was not required to do the same. Rosberg was then reassured that his fuel consumption levels were back on target and began to lap faster than his teammate. Vergne caught Bianchi and made minor contact with the Marussia driver at the Loews hairpin. Leaving the tunnel, smoke bellowed out of the rear of Vergne's Toro Rosso but he was able to limp back to the pit lane to retire on lap 52. Bottas was caught by Gutiérrez, Räikkönen and Massa – who was on fresh tyres – and Gutiérrez attacked Bottas at the Novelle chicane but Bottas kept eighth by cutting the corner. With smoke bellowing from his car on lap 55, Bottas drove to the side of the track at the Loews hairpin to retire. The need for a safety car was avoided when his car was removed from the track by a crane and yellow flags were waved in the area. Gutiérrez hit the inside guardrail at La Rascasse on lap 59, damaging the rear suspension of his Sauber and causing him to retire while in eighth and on course for his first points of the season. This promoted Bianchi into tenth, which put him in position to score Marussia's first points in Formula One, but he also earned a five-second time penalty for illegally taking his earlier, five-second time penalty under the safety car. After running closely behind teammate Rosberg and feeling the wind penetrating his visor, Hamilton got some dirt in his left eye on lap 66 and slowed in the circuit's low-speed turns as a result, allowing Ricciardo to close up to him. Hülkenberg had heavily worn rear super soft tyres, and by the 69th lap, was caught by McLaren drivers Button and Magnussen. Bianchi was told that he needed a five-second advantage over Grosjean to negate the time penalty. Five laps later, Button overtook teammate Magnussen on the main straight for sixth, Räikkönen then attempted to do the same around the inside at the Loews hairpin on lap 74 but ran too deep, leaving both himself and Magnussen in the barrier. Both Räikkönen and Magnussen reversed out of the barrier but lost a large amount of time, thus promoting Bianchi to eighth and Grosjean to ninth. Räikkönen had to make a third pit stop for a new front wing and had super soft tyres fitted. Rosberg opened the gap to 8.8 seconds, and won the race after completing 78 laps to secure the victory. Hamilton finished second, 9.2 seconds behind and held off the hard-charging Ricciardo at the start/finish line. Alonso took fourth, Hülkenberg was fifth and Button sixth. He was followed by Massa in seventh, Grosjean in eighth, Bianchi took ninth after his five-second time penalty was applied and Magnussen rounded out the points-scoring finishers in tenth. Ericsson missed out on Caterham's first points in eleventh, and Räikkönen, Kobayashi and Chilton were the last of the classified finishers. Rosberg's victory was his second of the season, his second consecutive win at Monaco, and the fifth of his career. The Mercedes team continued their dominance of the season with their fifth consecutive one-two finish. Rosberg led every lap of the race from pole position but was denied his first career Grand Slam when Räikkönen set the fastest lap of the race on the 75th lap with a time of one minute and 18.479 seconds. At the podium interviews, conducted by actor Benedict Cumberbatch, Rosberg described the day as "very, very special" and praised his car and his team. Hamilton said that despite the problem with his eye it was "a good day" and that it was "really good" that the team achieved a first and second-place finish. Ricciardo stated that it was "really nice" to be standing on the podium in Monaco and said third-place was the best his team could achieve. In the subsequent press conference, Rosberg said the victory was made more "special" because Hamilton had the momentum heading into the race and revealed that he was not surprised that he was not called into the pit lane following Sutil's crash. Hamilton revealed that he remained in a certain engine mode and that there was a tight battle between himself and teammate Rosberg of which he felt certain would continue until the late stage of the season. When asked if Red Bull would have the pace to challenge Mercedes, Ricciardo replied that he felt the team closed slightly in Monaco and the circuit favoured the car slightly better than at other tracks. Jules Bianchi (pictured in 2012) scored his and Marussia's first points in Formula One. Bianchi's ninth-place finish earned him his first career points and his team's first in Formula One in their 83rd Grand Prix start since entering under the name Virgin Racing in 2010. He told Sky Sports F1 that Marussia had been awaiting the result for a long period and since it had been achieved, he stated that he was "so proud" for his team: "They did a really good job and I am really happy to give them the result." Marussia team principal John Booth was delighted at Bianchi's overtake on Kobayashi, describing it as "stunning", and despite the five-second time penalty, his team were "absolutely over the moon" with the achievement. Graeme Lowdon, the team's chief executive officer, was pleased at the sign of progress, saying: "It is tough and I would be lying if I didn't reflect that", and the result was a "direct reward for people who have worked very hard." Alonso expressed his huge satisfaction for Bianchi, stating: "I am extremely happy for him, [and] very proud for what this result will mean for his career. I have no doubts it will be a good career, but hopefully with this result he can have a more competitive car next year and show his talents even more." Former driver Allan McNish wrote in his BBC F1 column that the result was like "a Grand Prix victory" for Marussia and that it was "a deserved reward for their dogged determination and never-say-die attitude." Following Bianchi's death nine months after sustaining severe head injuries at the 2014 Japanese Grand Prix, Will Dale of Fox Sports Australia wrote: "Monaco 2014 will be remembered as his day in the sun, the high watermark of a career — a life — ended far too soon." Tensions at Mercedes increased following the qualifying session in which Hamilton felt Rosberg had deliberately driven off the track in a bid to disrupt his effort of taking pole position which caused their relationship to deteriorate. Hamilton refused to accept Rosberg's apology for the incident and the two did not communicate with each other on the podium. The incident upset the team's non-executive chairman Niki Lauda who stated that his dislike of the lack of communication between the two drivers on the podium. Lauda revealed that he would speak to them before Canada. Toto Wolff, the Mercedes team principal, stated the incident between Rosberg and Hamilton would not be allowed to occur again in the future and affirmed the drivers would be allowed to do what they wished as long it was not performed in a deceitful manner. Hamilton said he did not have an answer and was surprised on how quickly the situation escalated. After Hamilton spoke with Rosberg, he posted a picture on Twitter with him and Rosberg in their youth to ease anxiety over their relationship, saying: "We've been friends a long time, and as friends we have our ups and downs. "Today we spoke and we're cool, still friends, no problem." FIA race director Charlie Whiting suggested that qualifying be extended by one minute to give drivers affected by yellow flags another attempt at a timed lap to prevent similar incidents in the future. Räikkönen was reprimanded by the stewards over his late race contact with Magnussen while they elected not to take any action over the first lap incident between Button and Pérez. Magnussen was adamant that Räikkönen was to blame for the incident, saying that he drove defensively but that the driver made an overtaking attempt, while Räikkönen admitted following his contact with Chilton earlier in the race, he was willing to attempt aggressive manoeuvres. Pérez blamed Button for his retirement, saying that he was battling his teammate Hülkenberg and did not expect Button to be in the position he placed himself in because of the lack of space for another car. Button made no comment on the incident. Red Bull team principal Christian Horner reckoned that despite Vettel's turbocharger failing, the driver would not allow his frustrations to get the better of him, and stated Ricciardo's challenge on Hamilton in the event's closing period was an indication that the approach the team used was correct but noted a realistic overtake was not possible unless the challenged driver made an error. The result meant Rosberg retook the lead of the Drivers' Championship with 122 points, four ahead of Hamilton. Alonso maintained third place on 61 points, while Ricciardo's third-place finish enabled him to move ahead of Vettel in fourth and was seven points in front of his teammate. Mercedes's one-two finish allowed him to further increase their advantage at the top of the Constructors' Championship to be 141 points ahead of second-placed Red Bull. Ferrari remained in third position with 78 points. Force India likewise kept fourth and McLaren moved in front of Williams to take over fifth place with thirteen races left in the season. ^3 — Jules Bianchi finished eighth, but five seconds was added to his race time for serving a penalty under the safety car, and he dropped one finish position to ninth. ^ The Friday of the Monaco Grand Prix is designated as a rest day as the event was traditionally linked to Ascension Day and the roads could re-open for the day. ^ The incident drew comparisons with Michael Schumacher's blocking of Rascasse corner in qualifying for the 2006 race which prevented Alonso from improving his time. ^ a b c d "Monaco Grand Prix – 2014 Preview". Fédération Internationale de l'Automobile. 20 May 2014. Archived from the original on 22 February 2017. Retrieved 3 May 2017. ^ "Formula 1 Grand Prix de Monaco 2014". Formula1.com. Formula One Administration. Archived from the original on 9 April 2014. Retrieved 13 April 2014. ^ a b c d Rowlinson, Anthony. "Monaco Grand Prix stats". F1 Racing. Haymarket Publications. July 2014 (221): 134. ^ Johnson, Daniel (26 May 2014). "Monaco Grand Prix 2014: Lewis Hamilton's feud with Nico Rosberg began at the Spanish Grand Prix". The Daily Telegraph. Archived from the original on 20 June 2014. Retrieved 3 May 2017. ^ Gill, Pete (21 May 2014). "Nico Rosberg insists he can beat Lewis Hamilton in single-lap combat at Monaco". Sky Sports F1. Archived from the original on 3 February 2017. Retrieved 3 May 2017. ^ "Lewis Hamilton on Monaco Grand Prix: 'I'm hoping we have a closer race'". The National. Agence France-Presse. 22 May 2014. Archived from the original on 29 May 2014. Retrieved 3 May 2017. ^ "Resurfacing Work on the Monaco F1 Grand Prix Circuit". Monaco: Portail Officiel du Gouvernement Princier. 28 March 2014. Archived from the original on 7 May 2017. Retrieved 3 May 2017. ^ Noble, Jonathan (21 May 2014). "Jenson Button: new track surface will change Monaco for F1 drivers". Autosport. Archived from the original on 22 May 2014. Retrieved 3 May 2017. ^ a b c Benson, Andrew (22 May 2014). "Lewis Hamilton leads team-mate Nico Rosberg in Monaco". BBC Sport. Archived from the original on 7 May 2017. Retrieved 3 May 2017. ^ a b c Galloway, James (23 May 2014). "2014 Monaco GP Practice Two: Fernando Alonso fastest after long waiting game". Sky Sports F1. Archived from the original on 7 May 2017. Retrieved 3 May 2017. ^ a b c Anderson, Ben (23 May 2014). "Monaco GP: Lewis Hamilton leads Mercedes 1-2 in FP1". Autosport. Archived from the original on 23 May 2014. Retrieved 3 May 2017. ^ a b Straw, Edd (22 May 2014). "Monaco GP: Fernando Alonso puts Ferrari on top in FP2". Autosport. Archived from the original on 23 May 2014. Retrieved 3 May 2017. ^ "Hamilton edges Rosberg to set Monaco pace". Speedcafe. 23 May 2014. Archived from the original on 22 October 2014. Retrieved 3 May 2017. ^ Spurgeon, Brad (26 May 2006). "Quiet days in Monaco". The New York Times. Archived from the original on 4 December 2013. Retrieved 26 November 2017. ^ a b "Hamilton tops final Monte-Carlo practice". GPUpdate. 24 May 2014. Archived from the original on 11 August 2014. Retrieved 3 May 2017. ^ Benson, Andrew (24 May 2014). "Lewis Hamilton heads Daniel Ricciardo in Monaco". BBC Sport. Archived from the original on 7 May 2017. Retrieved 3 May 2017. ^ a b Straw, Edd (24 May 2014). "Monaco GP: Lewis Hamilton leads Daniel Ricciardo in practice three". Autosport. Archived from the original on 24 August 2014. Retrieved 3 May 2017. ^ a b c d e f g h i j k l m n Hughes, Mark (26 May 2014). "2014 Monaco GP report". Motor Sport. Archived from the original on 7 May 2017. Retrieved 3 May 2017. ^ Parkes, Ian (24 May 2014). "F1 Monaco Grand Prix: Nico Rosberg under investigation for causing a deliberate incident that forced Mercedes team-mate Lewis Hamilton to abort his final lap". The Independent. Archived from the original on 7 May 2017. Retrieved 3 May 2017. ^ Smith, Luke (24 May 2014). "Stewards take no action, Rosberg keeps Monaco pole". NBC Sports. Archived from the original on 7 May 2017. Retrieved 3 May 2017. ^ Baldwin, Alan (24 May 2014). "Rosberg secures controversial Monaco pole". Chicago Tribune. Reuters. Archived from the original on 12 October 2015. Retrieved 3 May 2017. ^ "Rosberg beats Hamilton for Monaco GP pole". Times Colonist. The Sports Network. 24 May 2014. Archived from the original on 7 May 2017. Retrieved 3 May 2017. ^ a b c d "Monaco Grand Prix: Who said what after qualifying". ESPN. 24 May 2014. Archived from the original on 7 May 2017. Retrieved 3 May 2017. ^ a b c d e "Formula One Grand Prix de Monaco 2014". Formula1.com. 24 May 2014. Archived from the original on 25 May 2014. Retrieved 24 May 2014. ^ a b Straw, Edd (24 May 2014). "Monaco GP: pitlane start for Marcus Ericsson after qualifying clash". Autosport. Archived from the original on 25 May 2014. Retrieved 3 May 2017. ^ a b Medland, Chris (25 May 2014). "F1 Monaco Grand Prix: Bianchi hit with gearbox penalty". crash.net. Archived from the original on 7 May 2017. Retrieved 3 May 2017. ^ a b "GP Monaco in Monte Carlo / Rennen". motorsport-total.com (in German). Archived from the original on 29 October 2014. Retrieved 3 May 2017. ^ a b c d e "2014 Monaco Formula 1 Grand Prix – Race". GPUpdate. 25 May 2014. Archived from the original on 7 May 2017. Retrieved 3 May 2017. ^ a b c d e f g h i j k l m n o p Beer, Matt; Noble, Jonathan; Straw, Edd; Turner, Kevin; Anderson, Ben (25 May 2014). "As it happened: Sunday – Monaco GP". Autosport. Archived from the original on 24 October 2015. Retrieved 3 May 2017. ^ a b "Monaco F1 Grand Prix: F1 Driver quotes, Sunday". crash.net. 25 May 2014. Archived from the original on 7 May 2017. Retrieved 3 May 2017. ^ a b c d e f g h i j k l m n o Barretto, Lawrence (25 May 2014). "Monaco Grand Prix as it happened". BBC Sport. Archived from the original on 28 May 2014. Retrieved 3 May 2017. ^ a b c d e f g h i j Ostlere, Lawrence (25 May 2014). "Monaco Grand Prix: F1 – as it happened". The Guardian. Archived from the original on 7 April 2016. Retrieved 3 May 2017. ^ a b c d e f g h Mole, Giles (25 May 2014). "Monaco Grand Prix 2014: live". The Sunday Telegraph. Archived from the original on 7 July 2015. Retrieved 3 May 2017. ^ a b de Menzes, Jack (25 May 2014). "F1 Monaco Grand Prix – Live". The Independent. p. 1. Archived from the original on 27 July 2014. Retrieved 3 May 2017. ^ Noble, Jonathan; Beer, Matt (25 May 2014). "Monaco GP: Lewis Hamilton had to drive with eye closed". Autosport. Archived from the original on 26 May 2014. Retrieved 7 May 2017. ^ a b "2014 Grand Prix of Monaco". Racing-Reference. Archived from the original on 27 May 2014. Retrieved 3 May 2017. ^ Pugmire, Jerome (25 May 2014). "Rosberg holds off rival Hamilton to snag victory at Monaco Grand Prix". The China Post. Associated Press. Archived from the original on 5 July 2014. Retrieved 7 May 2014. ^ a b "2014 Monaco Grand Prix Press Conference". Fédération Internationale de l'Automobile. 25 May 2014. Archived from the original on 28 July 2014. Retrieved 7 May 2017. ^ a b c Esler, William (26 May 2014). "Ninth place for Jules Bianchi in Monaco saw Marussia score their first F1 points". Sky Sports F1. Archived from the original on 6 April 2016. Retrieved 7 May 2017. ^ Allen, James (25 May 2014). "Bianchi points could prove a lifeline for low budget Marussia team". James Allen on F1. Archived from the original on 28 May 2014. Retrieved 7 May 2014. ^ Anderson, Ben (26 May 2014). "Fernando Alonso 'very proud' of Jules Bianchi after first F1 points". Autosport. Archived from the original on 25 August 2014. Retrieved 7 May 2017. ^ McNish, Allan (28 May 2014). "Points in Monaco are like a win for Marussia says Allan McNish". BBC Sport. Archived from the original on 7 May 2017. Retrieved 7 May 2017. ^ Dale, Will (18 July 2015). "Jules Bianchi dead: Monaco GP in 2014 the high-point of an exciting talent's promising F1 career". Fox Sports Australia. Archived from the original on 7 May 2017. Retrieved 7 May 2017. ^ a b Noble, Jonathan (26 May 2014). "Hamilton surprised by feud with F1 team-mate Rosberg". Autosport. Archived from the original on 4 October 2015. Retrieved 7 May 2017. ^ "Niki Lauda plans peace talks between Nico Rosberg and Lewis Hamilton". The National. Agencies. 26 May 2014. Archived from the original on 28 May 2014. Retrieved 7 May 2017. ^ "No more 'little fouls' between drivers – Mercedes". ESPN. 25 May 2014. Archived from the original on 7 January 2015. Retrieved 7 May 2017. ^ Holt, Sarah (3 June 2014). "Mercedes pair Lewis Hamilton and Nico Rosberg echo Senna and Prost rivalry". CNN. Archived from the original on 7 May 2017. Retrieved 7 May 2017. ^ Schmidt, Michael (27 May 2014). "Maßnahme gegen Quali-Tricks: FIA diskutiert eine Minute Verlängerung". Auto, Motor und Sport (in German). Archived from the original on 28 May 2014. Retrieved 7 May 2017. ^ a b c Anderson, Ben (25 May 2014). "Monaco GP: Kimi Raikkonen penalised for clash with Kevin Magnussen". Autosport. Archived from the original on 26 May 2014. Retrieved 7 May 2017. ^ Noble, Jonathan (26 May 2014). "Red Bull sure Sebastien Vettel will not give up on 2014 F1 season". Autosport. Archived from the original on 25 August 2014. Retrieved 7 May 2017.